Epic Rap Battle Video! Al Capone Versus…? Hey everybody! I’m going on vacation this week, so I thought I’d give you all something fun to watch instead of something to read. Ever seen Epic Rap Battles of History? 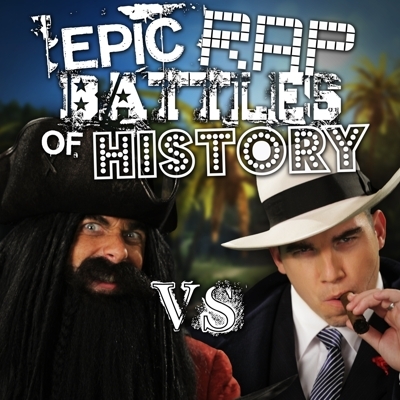 If you’re not familiar with them, they’re a series of YouTube videos created by Peter Shukoff and Lloyd Alhquist that feature various historical personages facing off in “epic” funny rap battles, usually taking the opportunity to diss their opponent using historical facts about their lives. While they can get pretty ridiculous at times thanks to relying on user-generated pairings—Hitler versus Darth Vader, anyone?—they usually manage to be both entertaining and clever. Personally, I get a big kick out of them. If I were a high school history teacher, I’d totally force my students to watch these and then make their own videos. This entry was posted in Al Capone, video post and tagged Al Capone, Al Capone epic rap battles of history. Bookmark the permalink. 1 Response to Epic Rap Battle Video! Al Capone Versus…?